285 x 202 mm. – 410 leaves: pp. , 400 (recte 401), . Large woodcut grotesque title border, woodcut title vignette of a storm-tossed galleon, 9-, 7- and 5-line woodcut initials. Produced for the use of Spanish-speaking Jews who had fled the Iberian states, the "Ferrara Bible" owed its existence to the city's liberal laws under the reign of Ercole II d'Este (1534-1559), which attracted Jews from Spain and Portugal as well as from the less hospitable Italian city-states. The Ferrara Bible would enjoy great popularity among Spanish and Portuguese Jews of Converso origin who knew no Hebrew and were in need of Jewish texts in the vernacular. 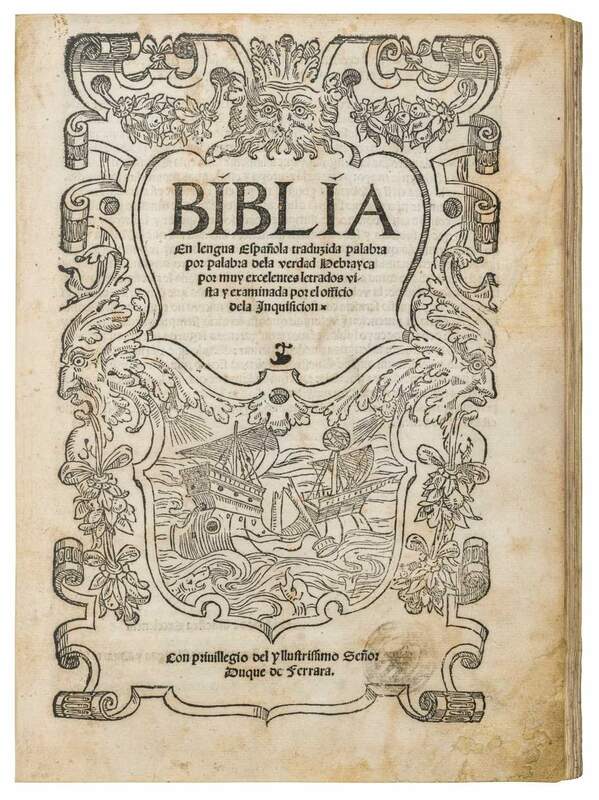 The Bible is of enormous interest in the Iberian world, especially in Spain, for the unusual way in which the text was translated (word for word in Spanish), for the earlier (Jewish) translations upon which it was based, and for its influence on later Protestant editions of the Spanish Bible. This edition was published by the Portuguese scholar-printer Abraham ibn Usque and financed by the Spanish Jew Yom Tob Atias. Usque had taken refuge in Ferrara before 1550, abandoning there his Christian name Duarte Pinel along with Catholicism, and published a number of Hebrew works of philosophy and theology from 1553-1557.